I made this super easy, super quick recipe today based on a Pinterest pin recipe with a link to a completely different recipe on http://www.DelightedMomma.com. Hmmmmn. Either way, they were delish! Put all ingredients in a blender and blend until well combined (about 45 seconds). Coat the bottom of a frying pan with olive oil and put on medium high. Once the pan is hot, pour your batter to make whatever size pancakes you want (I like mine silver dollar size) and cook for about 30-45 seconds on each side until golden brown. Depending on your burner and if you made larger pancakes, this time may vary. Use your own judgement. If you mess up you can always make more. And voila! 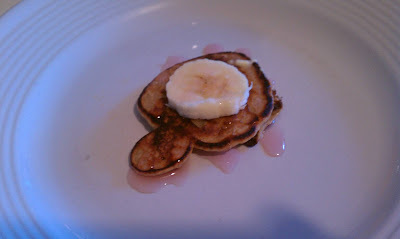 Gluten free skinny pancakes!